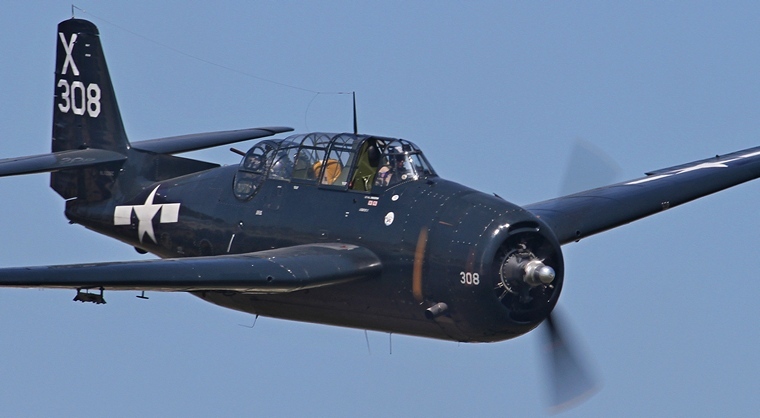 The Grumman TBF Avenger torpedo bomber that first saw action in 1942 during the Battle of Midway went on to become one of the outstanding torpedo bombers of World War II and was eventually used by several air and naval aviation services around the world. 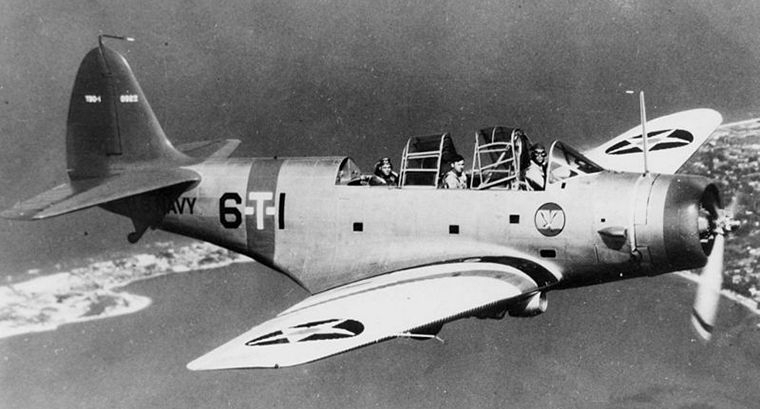 When WWII broke out in 1939 the USN (United States Navy) main torpedo bomber, the Douglas TBD Devastator, was only four years old but was already obsolete. A request for proposals was issued and bids were received from a number of companies. 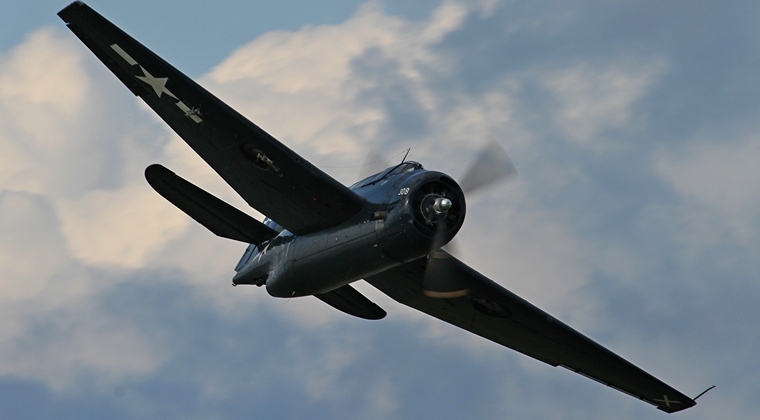 In April 1940 two prototypes each were ordered from Grumman and Vought. The Vought aircraft went into production built by Consolidated as the TBY Sea Wolf. Only 180 were ordered. Powered by a 1,750 hp (1,305 kW) Wright R-2600-20 Cyclone 14 cylinder twin-row radial engine the Avenger was the heaviest single-engine aircraft of World War II. The beast had an empty weight of 10,700 lb (4,853 Kg) and that could carry a load of 7550 lb (3431 Kg) as far away as 1,130 mi (1,819 km), all this whilst cruising at 23,400 feet (7,130 m) at 147 mph (238 km/h). The Avenger fairly bristled with guns and besides the pilot whose other responsibility was the .30 (7.62 mm) machine gun mounted in the nose two more crew members were required during operational sorties. (Later models had two 0.50 inch (12.7 mm) mounted in the wings. The radio operator was accommodated in a rear facing dorsal power operated turret behind the glass canopy fitted with a .50 inch (12.7 mm) machine gun. The bomb-aimer who was accommodated to the rear of the bomb bay had control of a 0.50 inch (12.7 mm) gun firing rearwards from position under and just forward of the tail. Designed at the outset as a torpedo bomber the Avenger had a capacious bomb bay in which it could internally carry a Mark 13 torpedo or a single 2,000 pound (907 kg) bomb or up to four 500 pound (227 kg) bombs. Later versions had underwing hardpoints on which up to eight 3.5-Inch rockets as well as bombs, external fuel tanks or radar pod could be carried. Excellent radio equipment, especially in an aircraft that was able to operate more than 1,000 miles from base, was an absolute must and the Avenger's radio equipment were massive filling the whole glass canopy to the rear of the pilot. The Pilot's position was not accessible to any crew members; access to the radios was via a tunnel from the operator's position. 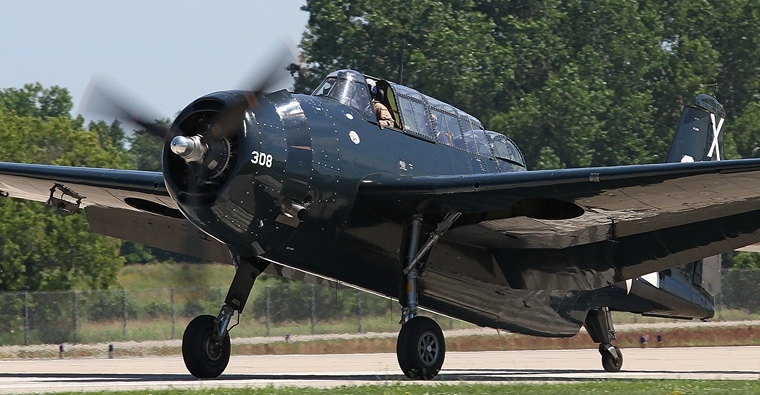 Avengers that are still flying today usually have an additional rear-mounted seat in place of the radios, allowing for a fourth passenger. Having entered service with the USN (United States Navy) the Avenger had its baptism of fire during June 1942 at the Battle of Midway. Douglas Devastators and six Avenger TBF-1s were present on Midway Island when the attack started. Five TBF-1s were shot down and the other returning heavily damaged with one of its gunners killed, and the other gunner and the pilot injured. 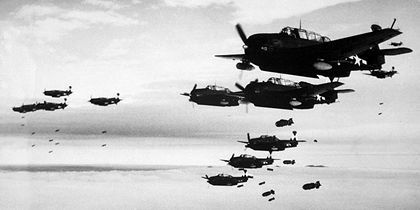 Nonetheless the US torpedo bombers were credited with drawing away the Japanese combat air patrols so the American dive bombers could successfully hit the Japanese carriers. Avengers attacks on Japanese shipping accounted for many losses including the Japanese light carrier Ryujo and the sinking the battleship Hiei during the Battle of Guadalcanal in November 1942 as well as the sinking of the two Japanese "super battleships "the Musashi and the Yamato. Avengers were the most effective sub-killers in the Pacific theatre responsible for the sinking of an estimated 30 submarines. A rather unusual kill credited to an Avenger happened when a FFA (Fleet Air Arm) Avenger on patrol was overtaken by a V-1 flying bomb. The Telegraphist Air/ Gunner in the dorsal turret open fire at 700 yards downing sending the V-1 plunging earthwards. Paul Newman, the famous actor, flew as a rear gunner in Avengers whilst George H. W. Bush, the youngest naval aviator at the time and future president was shot down on 2 September 1944. He managed to bail out after having released his payload. His crewmates did not survive. General Motors started Avenger production in mid-1944 when Grumman starting concentrating of the F6F Hellcat. The TBM-3 had more powerful engines and wing hardpoints for drop tanks and rockets and was the most numerous of all Avengers produced. Almost 10,000 Avengers were produced by Grumman and General Motors. 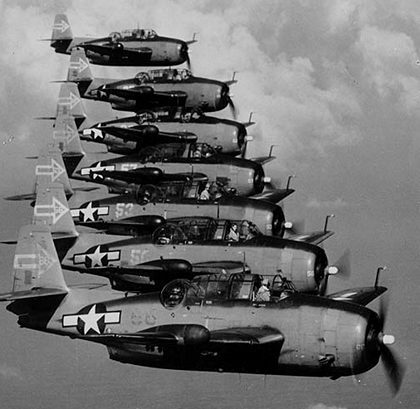 Post WWII the disappearance of a flight of Avengers made the headlines and seventy years later still remains a mystery. Surplus Avengers were adapted for civilian use. In New Zeeland the old war horses pioneered aerial topdressing that led to the establishment of an industry which markedly increased food production. Many have survived into the 21st century working as spray-applicators and water-bombers. Forest Protection Limited that began operating with 12 Avengers as spray applicators and water bombers in 1958 by 1971 had a fleet of 43. Their last Avenger was retired in July 2012. The Royal Canadian Navy operated 98 Avengers extensively modified with ECM (Electronic Counter Measures) equipment, sonobuoys and radar to serve in the ASW (Anti Submarine Warfare) role. A number of these aircraft were later fitted with a large magnetic anomaly detector (MAD) boom on the rear left side of the fuselage and operated until 1960. Despite the large numbers of Avengers produced only a few survive one of which thrilled the crowds during the afternoon airshows at AirVenture Oshkosh 2015.